STRETCHY SELFIE. Amy Erickson used a timer to capture a picture of herself inside her new downtown business, Latitude 44 Yoga Studio. The studio’s interior, shown below, features sheet metal and repurposed wood. 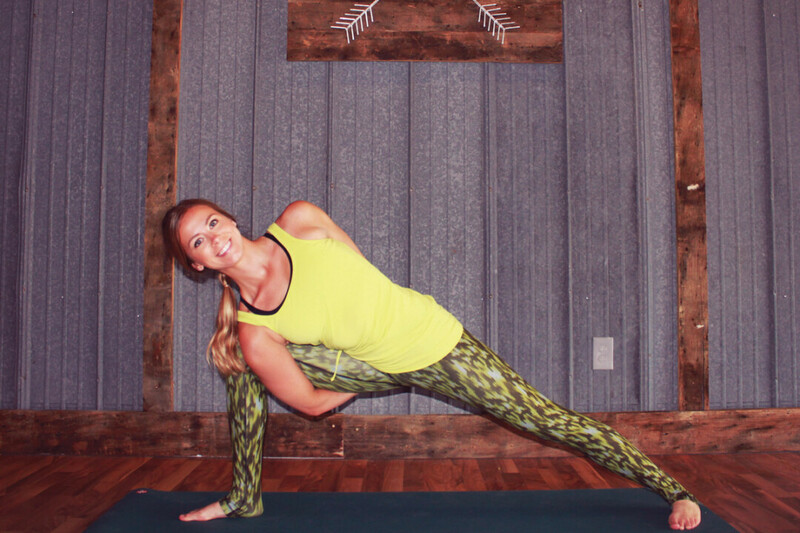 Applying the business skills gained from her eight years of employment with Moen Incorporated as a senior business analyst, Amy has a comprehensive plan on how to launch this downtown yoga studio into a successful community space. She completed 200 hours of yoga teacher training through Yandara Yoga Institute in Todos Santos, Mexico, and a prenatal certification through 8 Limbs Yoga Centers in Seattle. With a prime location, snug between Caffe Tempo and A Fun Dye Factory on Madison Street, this storefront yoga studio glows with a checkered window, each colorful square representative of chakra colors. The eye-catching design inside and out exhibits her thorough expertise in creating a yoga space – it’s an attractive, clean and warm environment for both beginners and seasoned practitioners to dive into a deep, enriching practice. 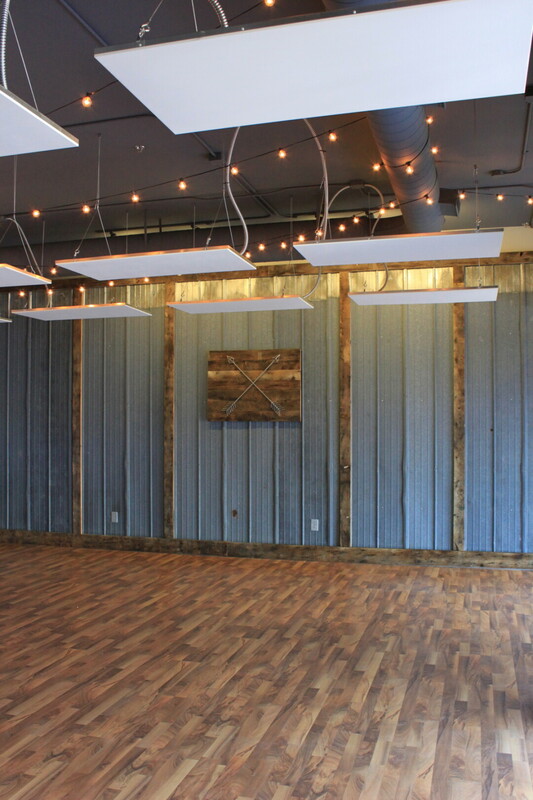 The west wall is flanked with sheet metal painted a dusty midnight blue and adorned with the studio’s emblem – two crossed arrows – mounted on reclaimed barnwood. 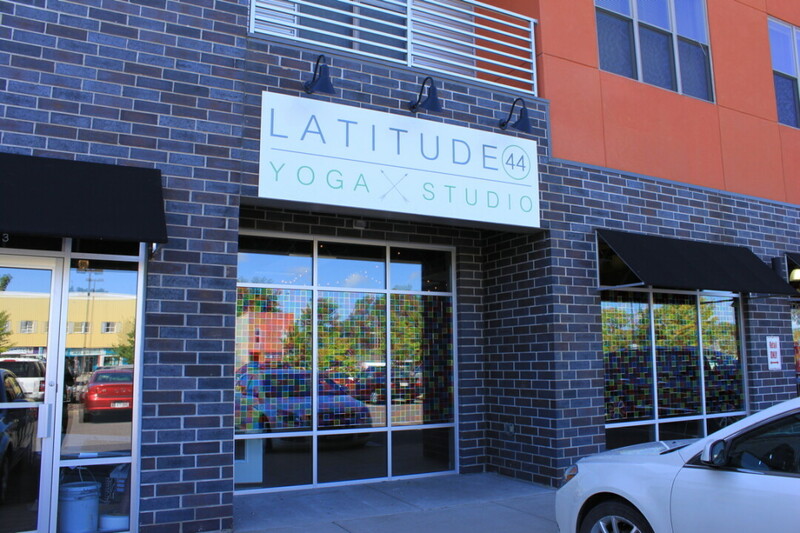 Latitude 44 will have diverse class offerings ranging from “Mindful Basics” to “From the Beginning,” and more intense, heated classes like “Heated Power Yoga” and “Iron-Yasa Yoga” (yoga incorporating light free weights), both of which have the room heated to 90 degrees using state-of-the-art infrared heat panels. The inaugural roster of teachers includes Amy Erickson, Jillian Kemmet, Misty Ross, and this writer. Private and community events will be part of their offerings as well. This October, Amy and Latitude 44 are collaborating on Hope in the Valley, organized by Angelus Salon & Spa with proceeds going to the American Cancer Society. Amy’s father is a recent cancer survivor and this has emboldened her to share wellness activities with those living with or recovering from cancer. Activities will include yoga, chiropractic, massage, physical therapy, and much more. Latitude 44 will be a great catalyst for the Chippewa Valley population moving toward mental and physical well-being. With their offerings in studio and forthcoming “Karma Yoga” volunteer events, Amy and team will strengthen our community through shared good intentions.